The Propylaea were built on the west side of the Acropolis hill. The first propylon, or gate, was constructed in the age of Peisistratos (mid-sixth century BC), after the Acropolis had become a sanctuary dedicated to Athena. A new propylon, built in 510-480 BC, was destroyed by the Persians in 480 BC and repaired after the end of the Persian Wars, during the fortification of the Acropolis by Themistokles and Kimon. The existing Propylaea were part of the great Periklean building program. 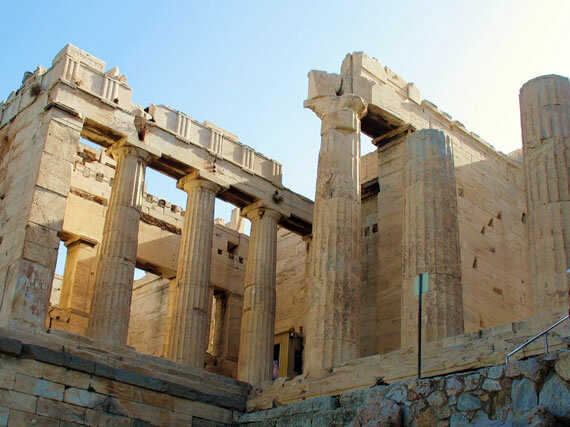 They were erected in 437-432 BC, after the completion of the Parthenon, by architect Mnesikles. The Classical Temple of Athena Nike is located at the southeast part of Acropolis. It was designed by architect kallikrates and built in 426 – 421 B.C. The temple is a small Ionic amphiprostyle structure with four monolithic columns on either short side. Above the epistyle there is a frieze. On its three sides there are battle scenes between the Greeks and Persians and on its fourth side there is an assembly of the Olympian Gods watching these battles. The Parthenon, the finest monument on the Acropolis in terms of both conception and execution, is the most magnificent creation of Athenian democracy at the height of its power. It was built between 447 and 438 BC, as part of the greater Periklean building project, this so-called Periklean Parthenon. It was designed by architects Iktinos and Kallikrates, while the sculptor Pheidias supervised the entire building program and conceived the temple’s sculptural decoration and chryselephantine statue of Athena. The Parthenon is a double peripteral Doric temple with several unique and innovative architectural features. The temple is divided into pronaos, cella and opisthodomos, with a separate room at the west end, and is surrounded by a pteron with eight columns on each of the short sides and seventeen columns on the long ones. The interior demonstrates an innovative approach to both new and old elements: inside the cella a double pi-shaped colonnade established a background for the gold and ivory statue of Athena Parthenos, which showed the goddess in full armour carrying Nike (Victory) to the Athenians in her right hand. 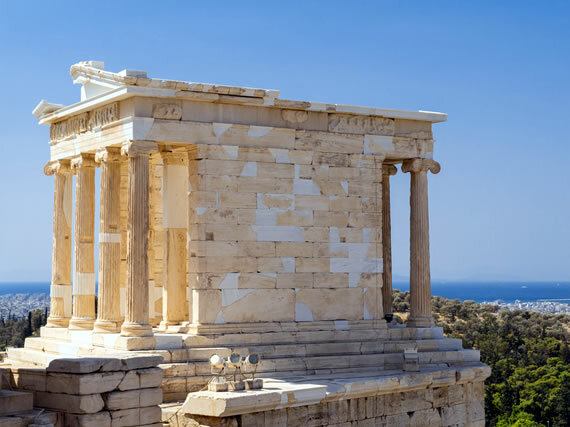 The Erechtheion temple was erected in 421-406 B.C. as a replacement of an earlier temple dedicated to Athena Polias, the so-called ”Old temple”. 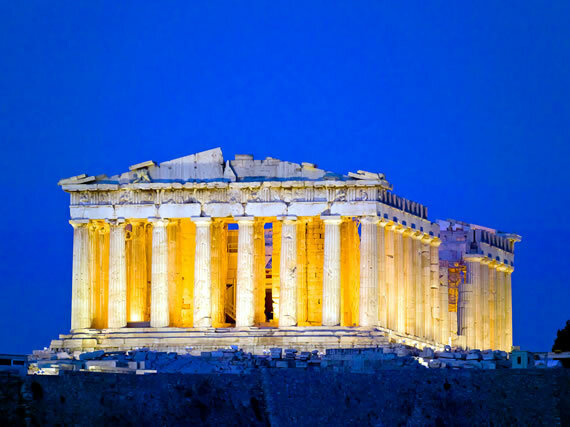 It stands on the north side of the sacred rock of the Acropolis. The building owes its unusual shape to the irregularity of the terrain – there is a three-meter difference in height between the eastern and western parts. The temple was made of Pentelic marble. 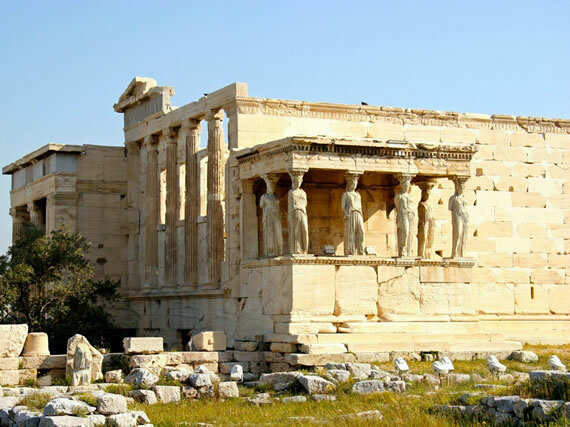 In the south part of the temple there is the porch of the Karyatides, a pi-shaped structure with six female statues instead of columns to support the roof. The statues were named Karyatides after the young women from Karyes of Lakonia who danced in honor of the goddess Artemis. Five of the Karyatides are in the New Acropolis Museum and another is in the British Museum. The visitors see casts on the building.